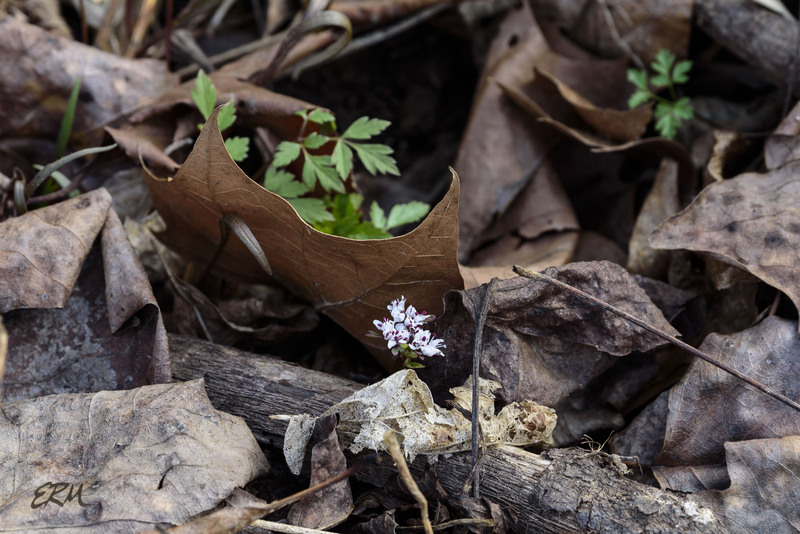 Today is the first day of meteorological spring* (astronomical spring is still three weeks away), but as of yesterday, the 28th of February, the wildflower show had already begun along the Potomac. Barely. Just a few dozen of these were up in sheltered locations. This one specimen of Packera aurea (golden ragwort; Asteraceae) already had well-developed buds. Often this species will retain leaves through the winter, and many low-lying leaves were visible, but I saw none of the tall growth yet. In the same location last year just a few flowers were open on March 23, with peak bloom about April 13; in 2015, I saw the first ones March 24, with peak bloom in mid-April. More about this in an upcoming post. Can you see it sheltering there under the maple leaf? That’s one plant with about 14 flowers! 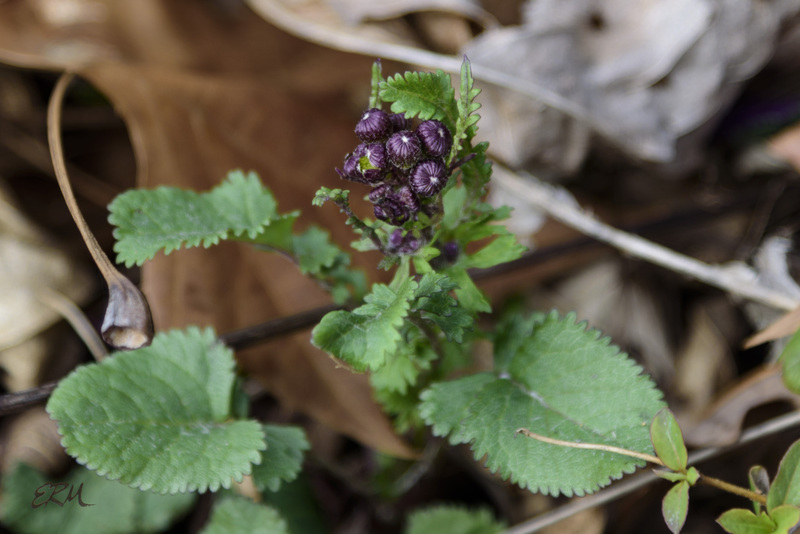 A few alien species are starting to bloom: Veronica hederifolia (ivy-leaved speedwell) and Cardamine hirsuta (hairy bittercress). And, I saw one clump of Mertensia virginica (Virginia bluebells) foliage emerging, but that makes a boring photo. This entry was posted in Uncategorized and tagged Cardamine, Claytonia, Erigenia, Mertensia, Packera, Veronica by elizabeth. Bookmark the permalink. They seem so different from the rest of their families. I would not have recognized that as related to portulaca. We were just talking about how Baccharis does not look like something related to asters. It really doesn’t! 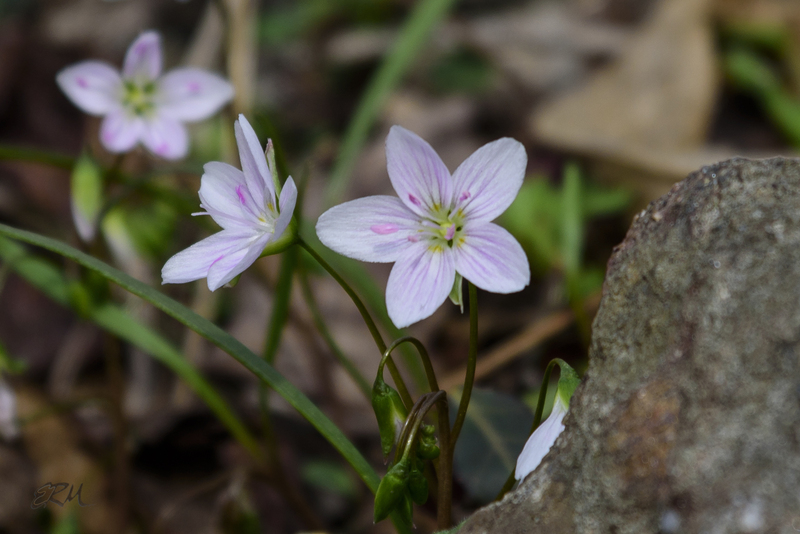 Your first comment reminded me that I made a mistake – the genus Claytonia is now placed in the Montiaceae. Portulacaceae is now a monotypic taxon. I can’t keep up with the taxonomic changes.